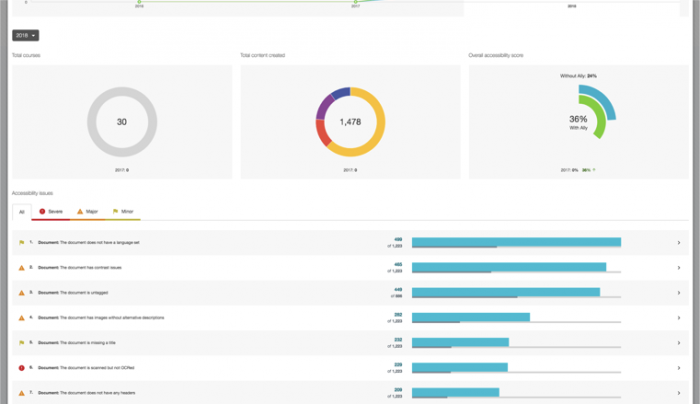 Ally is a tool that assesses the accessibility of your content on the LMS and provides guidance for making improvements. 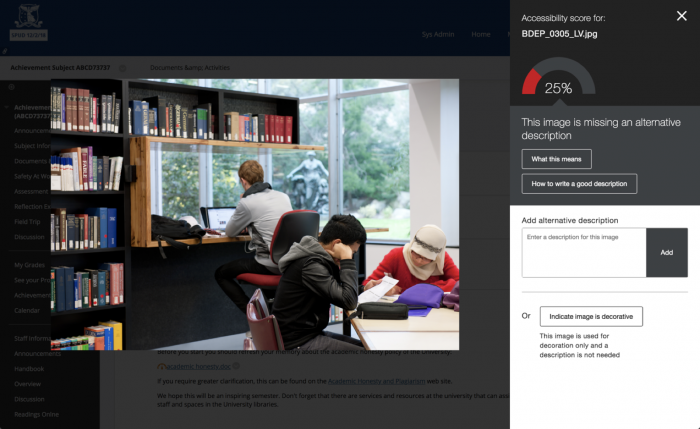 The University is currently piloting Blackboard Ally, an automated accessibility advisory and alternative formats tool that integrates with the LMS and improves the accessibility of content for students. Ally provides automated assistance to improve accessibility in multiple ways. It provides staff with accessibility scores for content on the LMS and suggests ways to improve these scores. Additionally, it automatically creates alternate versions of the content files that provide students with the flexibility to choose the formats they prefer to use. For example, they can choose to view content in HTML for improved reading on mobile phones, or as audio for learners who prefer to listen to content. 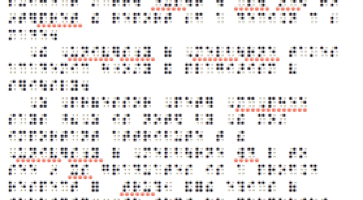 Students with visual impairments can choose to view the content in audio or electronic braille alternative formats. 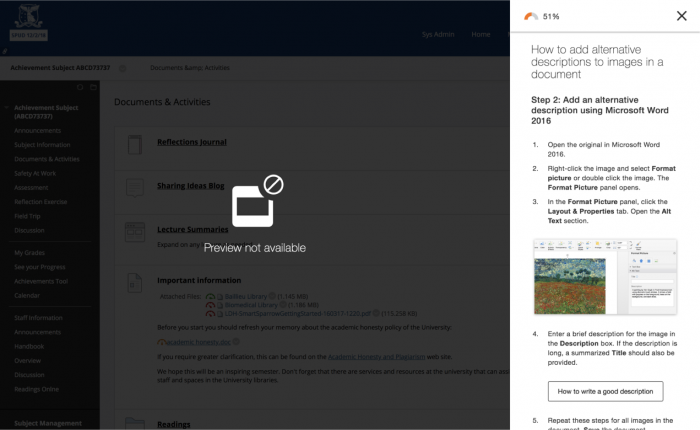 The tool attempts to render alternative versions of all uploaded content and content pages within your LMS subjects. A sub-menu becomes available on each content item that has been successfully processed, listing the alternative accessible formats it was able to produce. This functionality is not only useful for accessibility reasons but also provides flexible study options for students. Further information on alternative formats is here. Alternate formats of content are created by Ally. The tool provides an accessibility rating for all content in the form of a green, yellow or red coloured icon. Clicking on the icon will provide detailed feedback on the content item and ways to improve its accessibility score. The icon is visible to staff only, and is there for them to take optional action on. Some changes can be made immediately, for example providing a textual description of an image. Other changes may require you to open the content in the corresponding application. ALLY provides guidance on the actions to perform in that application to implement the improvement. For more information on accessibility scores visit this link. Reporting is provided that summarises the changes made, the improvements possible and the increase in accessibility achieved. This reporting is made available at the subject and organisational level. Further, a trial to provide translated versions of the content is currently underway and will be used to collect feedback about translations and their quality. Translated versions are available in a number of languages, the full list can be found here. At this point in time, the Faculty leadership of Engineering, ABP, FVAS and FBE have nominated a restricted pilot to just those subjects with identified disabled students. Subject leads in those faculties with such subjects should have already received a direct invitation to participate in the pilot. For other faculties, if you would like to nominate to be a pilot participant, or for anyone who may have any other enquiries or concerns, please contact us.